In the summer, dogs must stay hydrated. In addition to having water available, it is advisable for pets to eat canned (wet) food. With the arrival of summer, it’s natural that you should change his diet to incorporate more liquids and foods that are easy to digest. This will not only allow you to care for his digestive system, but also prevent heat stroke, which would put his health in danger. 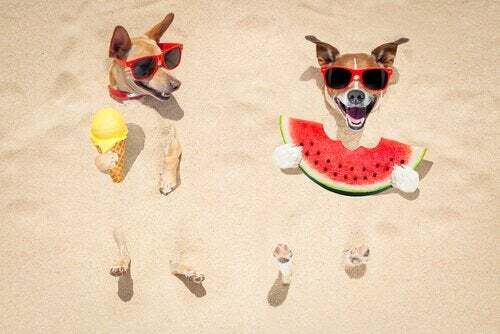 Find out what the best summer food for dogs is so you can take good care of yours. There can be serious physical and psychological consequences for dogs after prolonged exposure to the sun, especially if he’s in an enclosed space such as a room without ventilation or a car with the windows rolled up. The guidelines to protect your dog from heat stroke are not very different from those for people. First, ensure that your dog is hydrated and has water available to drink. 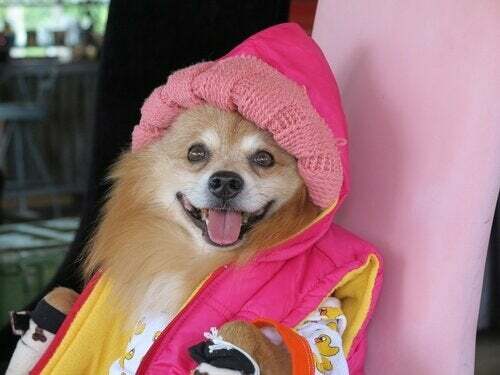 If, for some reason, you have to leave your dog alone for long periods of time, make sure he stays in a ventilated room, protected from the sun’s rays and with a water source he can easily access. If your dog has very long hair, try to shave it as soon as temperatures start to rise so that he can stay cool and comfortable. Many people don’t know how big a role food plays in an animal’s hydration. Both cats and dogs need wet food in their diet because it acts as another source of water. 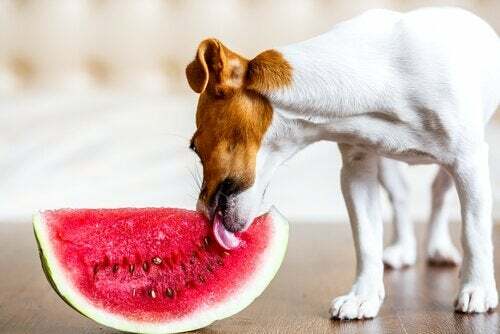 The melons and watermelons that you like so much are actually an ideal appetizer for your dog. Not only are they a source of water, but their coolness helps lower his body temperature. Only feed him seedless melons so he won’t choke. 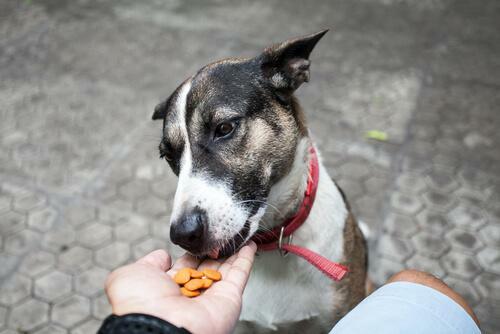 Ginger is soothing for your dog’s stomach, in addition to having anti-inflammatory properties. To make it more appetizing, you can make refreshing ice cream with watermelon juice and ground ginger. 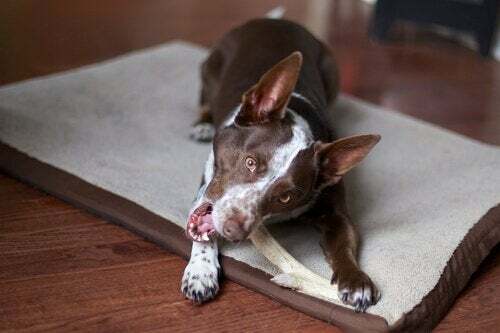 Fresh carrots are a great source of vitamins and minerals for your dog, and also can replace his usual bone or chew toy. They’re a source of beta carotene, vitamin E and B complex. Green beans are rich in fiber. Just mix them in with his usual food to help regulate his digestion. Coconut milk is not just a fashionable beverage for humans. This nutritious liquid is just as good for dogs, especially on long excursions in the sun. 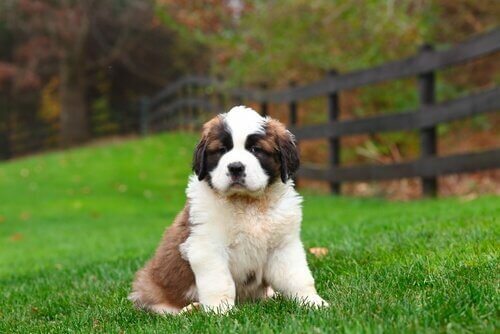 Puppies may have an intolerance to coconut milk, so refrain from giving it to them until they’re older. 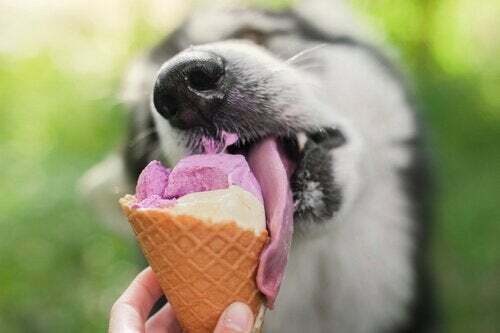 Believe it or not, ice cream for dogs exists. Since conventional ice cream can hurt animals’ digestive systems, companies like Frosty Paws make lactose-free ice cream suitable for puppies and adult dogs. Talk to your veterinarian to find out if these refreshing treats are sold in your area.